Today we introduce you to Elaine Lascher, one of the members of the 40+Style Club. She will be sharing her personal highs and lows as she transitions from colored hair to natural gray n our new series, Journey Into Gray. “Let go of that which no longer serves,” said my yoga teacher to our group of 40 students one Monday morning in Sedona, Arizona. I have heard those words often and now that I’m 65 they make a lot of sense to me. At this age I want a simpler life and have taken steps to get rid of household things and clothes that don’t fit or flatter my shape. I am discovering a personal style that is more in line with my goals of staying healthy and fit, traveling and doing things that I love with friends and family. I have used single process color on my fine, straight hair since the 1980s and it has been a great ride. But a few years ago I noticed the texture and color of my hair was beginning to change. Instead of dark roots around my face, the growth was lighter. The same held true for the top and visible sections on the nape of my neck. I knew it was time to do something. For years I’ve admired friends and acquaintances whose hair had turned a beautiful silver or salt and pepper color. 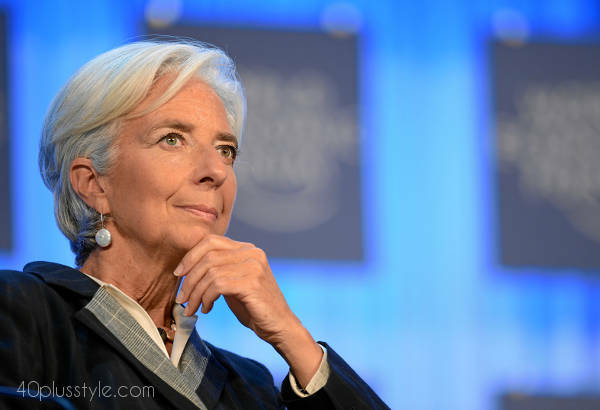 My favorite gray style icons include Dame Judi Dench, Helen Mirren, Christine Lagarde and women from the fashion world like Yasmina Rossi, Linda Wright, Cindy Joseph and Eileen Fisher. I began reading articles about women who took the leap from processed hair color to natural gray but when I broached the subject with my colorist she said, “not yet”. Soon after she closed her shop unexpectedly and moved away. I spend the winter months in Arizona so I discussed the topic with my Sedona colorist, Wendy Rella, and she was game to help me with the transition. 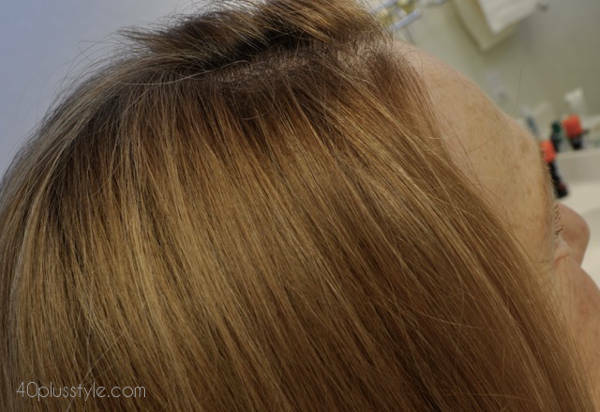 Wendy recommended moving from the single process color to highlights at first to keep a layer of color on top and near my face while allowing the roots to grow underneath. Later as the natural growth increased I would let go of the highlighting process. Not a complicated thing at all! Between appointments with Wendy I researched haircuts and transition strategies online and created a Pinterest Board for haircuts I liked with pins of stylish women with natural hair color and light complexions, like mine. I’m 65. If now is not the right time to transition to grey, when is? During spring and summer I wear hats to keep the sun at bay, a convenient way to disguise the new growth during awkward stages. The current trend in hair color is lots of tones and textures so my multi-tonal transition would look less obvious as other women opt for this trendy look. After all, I still want to look trendy too! On my next visit to Wendy I asked her to cut my hair in an inverted bob style to get rid of a lot of the single process color. She agreed, gave me a wonderful cut and then highlighted the top and hairline using foils so I would be less aware of the change that was taking place underneath. I love my new haircut. It is easy to manage and maintain and can be dressed up by adding some beachy waves with the curling iron. I have received many compliments from people who notice the new haircut but so far not the gray growth that is starting to emerge. The online community at 40+Style has also been very supportive which encourages me to go forward confidently. So far I am comfortable with my decision and although I may have some difficult moments along the way, I look forward to the transition with a sense of adventure–and letting go of the artificial hair color that no longer serves me. 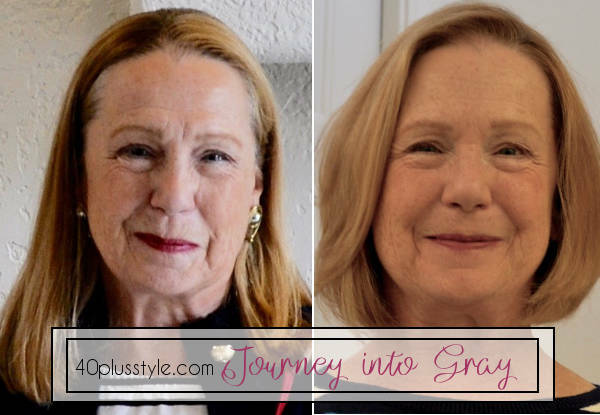 Are you considering going gray? You may like to read our previous article to gray or not to gray to join the discussion. We will continue to follow Elaine through her journey into grey. Sign up for our email newsletter to make sure you don’t miss it. 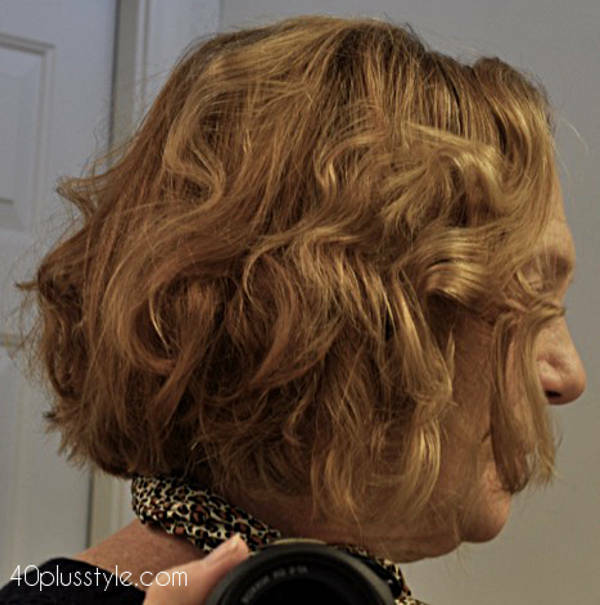 If you like to share your images of transitioning into gray, feel feel to send them to us at support [at] 40plusstyle.com and we may them with the next article. What do you think of Elaine’s transition to gray look? Way to go, Elaine. You are transitioning in a trendy way! Great article and inspiring for people ready for the journey. I’m not there yet but when I am I’ll look to you for inspiration. Terrific Elaine! Good for you! I only colored my brown hair sporadically but decided to forego it and just go with my gray. I don’t have a lot (yet) and it hasn’t really been any issue to anyone other than myself! (We’re always our worst critics, aren’t we?) I do have a bit of a Cruella DeVille streak going on right where my side part is but so what?! I’m looking forward to seeing your progress. I think you’re going to look great! P.S. Yasmina Rossi is one of my online/social media idols! Isn’t she gorgeous! And gray! Good going Elaine! I transitioned a couple of years ago and never looked back. Of course, I have to be sure and wear a slightly brighter lipstick for contrast. It’s so freeing and my hair feels healthier. Bravo!!! I am really struggling with this. Inspirational. I colored my long-ish hair with the ‘washes out in 8 weeks’ variety for a couple of years. Then I got it cut shorter and simply let it wash out. Never had the tell-tale root line. Good advice! Looking forward to seeing the images. I commend your “moxie”, too, Elaine! It’s a big move to ‘give in’ to grey, I made the decision to stop putting foils in my hair a couple of years ago. I also changed my hairstyle, going from the ‘bob’ I had worn for years to a shorter layered style. I didn’t enjoy the growing out process, and it took me a while to mange my new hairstyle, but I’ve no regrets – it turns out I had a head of lovely silver hair hiding under those multi-coloured foils! One of my friends gave me an apron emblazoned with the words “Silver is the new Blonde”! I wear it with pride. High to low light color processing is what my expert stylist has been doing for years. It looks great on my naturally dishwater blonde hair. I still wear shoulder length hair and only have to color twice annually. We laugh about whether new growth is dishwater or gray. Looks great! I recently decided to stop covering my greys. So far I’m two months into the process and have about an inch and a half of virgin growth. It’s quite a liberating feeling! I plan to have my stylist do platinum streaks in the front to ease the visual transition. My hair is quite long ( it falls to my lower back) so this transition will take a long time, but at 48 years old I feel like it’s the perfect time to make the leap! I have not considered being grey. And I wonder whether I will ever do so. My mother is 88 and still doesn’t let it go grey haha. It doesn’t suit my lifestyle (yet?). I am I high maintenance woman. Always have been and feeling good with that. But, I can totally appreciate women who do take the leap and turn silver grey. Usually it suits them fine. Are the handsome ones go for this easier? I’m 6 months in to growing out my hair. As a newly minted 60 year old I figured if not now, when? Fortunately for me I’m only about 20% gray so the tranistion hasn’t been hard at all. I’m not sure what prompted my decision but in part I have a few friends that are 100% gray and the time and expense they have with upkeep is daunting. I figured it would be easiest to ease into it now and fortunately for me I’m able to do that. I find it interesting what color of gray we end up with. I was a light brown in my youth and now I’m that with gray just on my left sided part and hardly non if parted on the right or elsewhere on my head. Thinning hair is much more a concern for me than color. I went from brown hair with blonde highlights to starting to grey on top. I felt gronde, neither grey nor blonde. So after a few months, I dyed it dark brown, I needed a break from three different colors. I’m going to try again when I have more grey. Previous post: Met Museum & NYC Ballet Gala – 15 bold color looks!